Welcome Aboard IHC185™ Internet Horology Club 185 IHC185™ Discussion Site Main Page BUY AND SELL HERE, THE IHC185™ TRADING MART IHC185™ Members Business Directory Cerullo Watch Repair NEW phone number! Cerullo Watch Repair has a new phone number. 570-406-7695. Of course we can be reached via email at pawatchmaker@verizon.net or through our website at www.pawatchmaker.com. 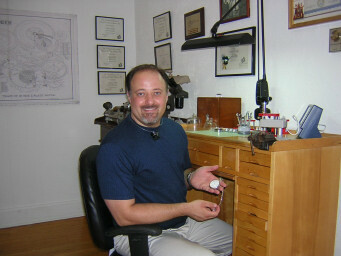 I am a graduate of the National School of Horology and I have completed continuing education courses with the American Watch and Clockmakers Institute and the Ohio Watchmakers Association as well. My shop has state of the art equipment, including wet and dry water resistance testers, a Witshi Watch Expert III timing machine including both quartz and Accutron timers. Estimates are free and all work is guaranteed. Quick Reply to: Cerullo Watch Repair NEW phone number!